Mmmmm delicious hot buttered corn. 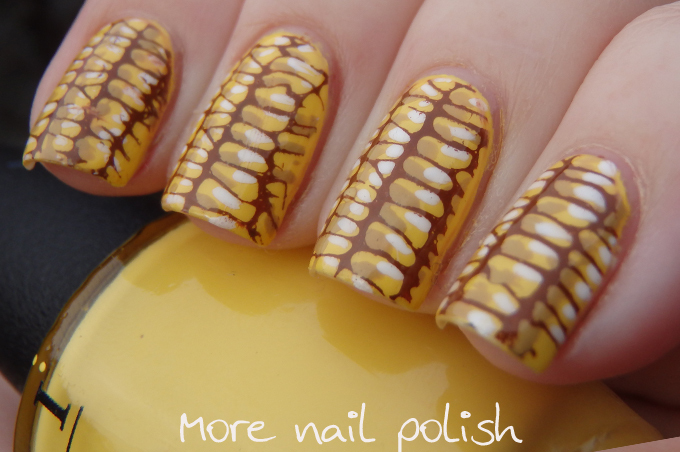 My yellow nails for day three of the challenge were actually really simple to create, but they looked very effective. I used OPI I Can't Cope-a-cabana as my yellow base. 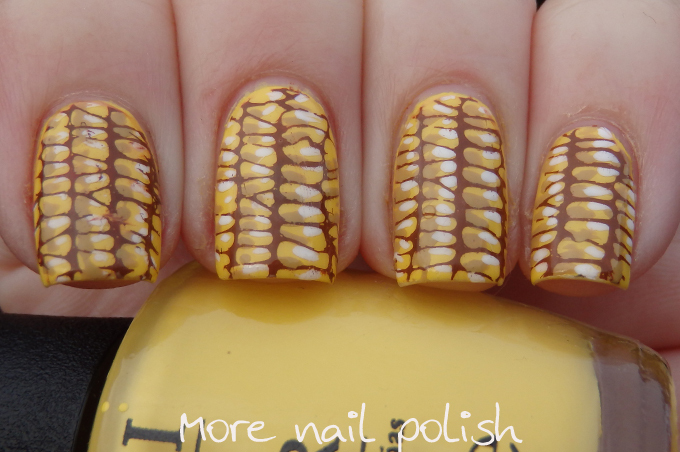 I then did some stamping decals using the Messy Mansion MM23 with the corn design on it. For my brown stamping polish I mixed some Mundo de Unas Reddish and Green together (MdU mixes so well to make other colours!). 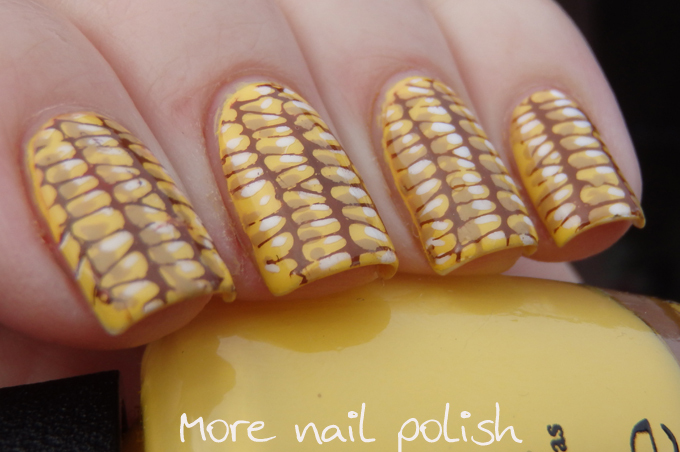 I then added light and dark yellow highlight and shadow dots to each corn kernel before sticking the stamp down onto my nails. I used the same technique as I showed in this post. Thanks to everyone using the inLinkz, it makes is so easy to visits everyone's blog posts. I'm trying to get to all of them, and to comment, but it's hard to keep up with everyone's amazing work! My yellow nails from 2013! OMG so cool and effective. They look totally delicious!! Mind. Blown. This is so damn stunning and super adorable. Such a cute idea. Trompe l'oeil nails! Brilliant idea, and so well done! Love these nails so much! Great job! OMG that is so life like ! 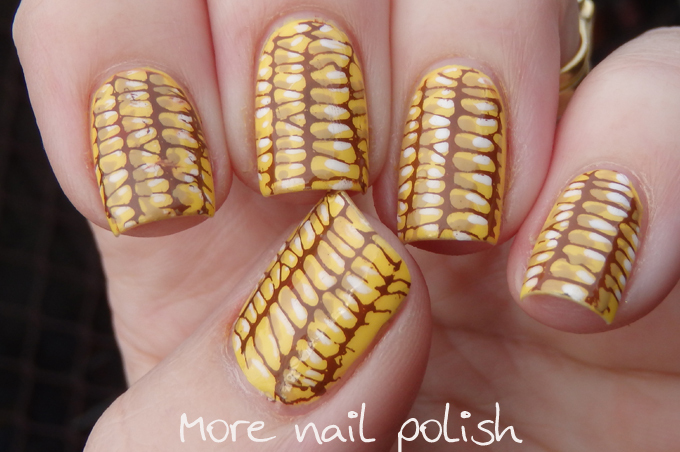 I think I want to eat corn now... That looks perfect and what a great idea!